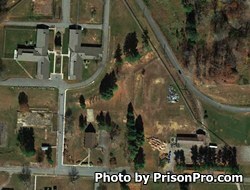 Swannanoa Correctional Center for Women is located in Black Mountain North Carolina. It is a minimum custody prison that houses 366 female offenders. The facility is comprised of four dormitories which are Greenwood, Gilliat, Sloop, and Frye. Inmates may participate in vocational classes to learn a new skill, and educational classes to earn a GED. All inmates are provided basic medical, dental, and mental health treatments. Additionally a substance abuse treatment program is available to inmates at this facility. Visiting at Swannanoa Correctional Center for Women occurs on Saturdays in two sessions. The morning session is from 8:30am-10:30am and the afternoon session is from 1:30pm-3:30pm. The session your inmate is allowed visits will depend on the first letter of their last name. This schedule rotates every six months. Contact the facility for the current rotation.